The meat from mature pigs gets a bad name. Often overlooked, and destined only for the grinder, we’re hoping to turn it into something to really enjoy and get excited about. Sows are a part of pork production. Female pigs are carefully chosen from the herd to be a mother based on genetics, build and/or temperament to bring out the traits the farmer wants in their pork and to “chill” the herd so to speak. At our friend Jeff Linton’s farm, Linton Pasture Pork in Huron County, these ladies get to spend the next few years wandering the fields, foraging and being a mother to help raise the pork we eat. In General, the pork industry prefers a younger animal (typically 6-8 months in conventional production) for a more tender product. The older a pig gets, the more their muscles have worked which in turn, develops more collagen (the protein that wraps muscle fibers to make the “grain” you see in meat), which gives the meat more “chew”. So, as you can expect, the meat from a more mature animal will be significantly chewier than your average pork chop. Muscle will also develop more myoglobin (the protein that makes meat red) and intramuscular fat (“marbling”) which produces much darker meat with an almost beef like appearance. We’ve dealt with many sows over the years, and one thing always struck me. Here we have this well marbled, beautiful dark meat from an animal that has given us so much and helped to feed so many, and the best we can do with her is sausage? Then one day back in February, I got a text from Jeff: “I’ve got this 4-year-old purebred Berkshire sow and I want to make it delicious”, my immediate response was “Yes!”. This led to the question, “what would happen if we dry aged it?”. It’s no secret that dry aging leads to a more tender cut of meat. By giving it time and the right conditions, the natural enzymes in the meat will begin to break down the connective tissue, while the constant circulation of cold air prevents spoilage. When we break down hogs, we actually prefer to hang our loins for up to a week to improve the quality of our chops. Even in that short time we can see the meat slightly firm up and the tenderness increase. So it seemed, we had to find the answer. As of today, we’ve been hanging the loins from Jeff’s sow for 35 days and it was time for a test. What we ended up with was, in a word, amazing. The chops cooked up to be firm, yet perfectly tender with an intensely deep, rich flavour that is everything you could ever ask for in a pork chop. It’s a far cry from the boot leather we’ve been taught to expect, and dare I say, one of the best pork experiences I’ve ever had. For now, we’ll have a limited number available this week for you to try. But fear not my friends, we’ll be doing this with every future sow we can get our hands on. Shoulder end after 35 days. 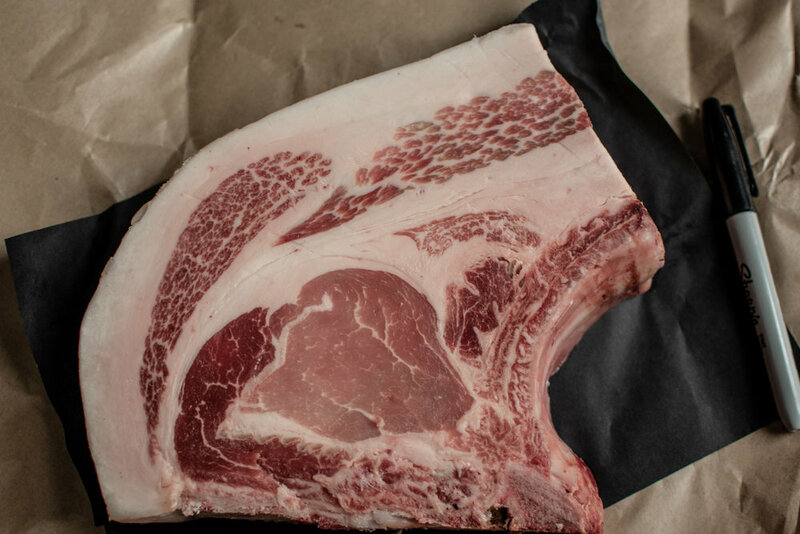 35 day Dry-Aged, 4 year old Berkshire sow chop. Sharpie for scale. We highly recommend cooking these to medium. Pull them off of your pan or BBQ when the internal temperature reads 135f, then let them rest for at least 10 minutes, the temperature will continue to rise to about 145f. © 2019 The Bauer Butcher Company Inc.